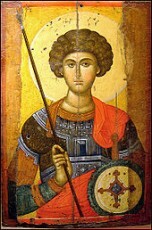 St. George was a Greek who became an officer in the Roman Army. He was in the Guard of Diocletian, and is venerated as a Christian Martyr. St. George is one of the most venerated saints in the Catholic Church, both Western and Eastern Rites. He is immortalized in the tale, St. George and the Dragon, and is one of the Fourteen Holy Helpers of the Catholic Church. He is regarded as one of the most prominent military saints. It is believed that St. George was born to a Greek Christian noble family in Lydda, Palestine, during the late third century between 275 and 285, and he died in the Greek city Nicomedia, Asia Minor. His father was an officer in the Roman army. His mother and father were both Christians and from noble families of Anici, so George was raised with Christian beliefs. The decided to call him George, meaning “Worker of the Land”. At the age of 14, George lost his father, a few years later, his mother. At that point, George decided to go to Nicomedia, the imperial city of that time, and present himself to Emperor Diocletian to apply for a career as a soldier, like his father. Diocletian welcomed him with open arms, as he had known his father, one of his finest soldiers. By his late twenties, George was promoted to the rank of Tribunus, and stationed as an imperial guard of the Emperor at Nicomedia. In 302, Diocletian issued an edict that every Christian soldier in the army should be arrested and every other soldier should offer a sacrifice to he Roman gods of the time. However George objected and with the courage of his faith approached the Emperor and ruler. Diocletian was upset, not wanting to lose his best Tribune and the son of his best official. George loudly renounced the Emperor’s edict, and in front of his fellow soldiers and Tribunes he claimed himself to be a Christian and declared his worship to Jesus Christ. Diocletian attempted to convert George, even offering gifts of land, money and slaves if he made a sacrifice to the Roman gods. The Emperor made many offers, but George never accepted. Realizing he was getting nowhere with his efforts, Diocletian was left with no choice but to have him executed for his refusal. Before his execution George gave his wealth to the poor and prepared himself to die. After various torture sessions, including laceration on a wheel of swords in which he was resuscitated three times; George was executed by decapitation before Nicomedia’s city wall on April 23, 303. A witness of his extreme suffering convinced Empress Alexandra and Athanasius, a pagan priest, to become Christians as well, and so they too, joined George in his martyrdom. His body was returned to Lydda, Palestine for burial, where Christians soon came to honor him as a martyr for the faith. St. George was a Greek who became an officer in the Roman Army. He was in the Guard of Diocletian, and is venerated as a Christian Martyr. St. George is one of the most venerated saints in the Catholic Church, both Western and Eastern Rites. He is immortalized in the tale, St. George and the Dragon, and is one of the Fourteen Holy Helpers of the Catholic Church. He is regarded as one of the most prominent military saints. He was one of Diocletian’s highest-ranking soldiers, and refused to make a sacrifice to the Roman gods. He was executed in a severe way, but his witness to the faith converted many, including the Empress Alexandra.